An enchanting rural house in the heart of Cantabria. Set at the foot of the Saja-Besaya Natural Reserve, Maria's country house is a haven of peace, greenery, friendliness and art. Surrounded by mountains yet just a stone-throw away from the ocean, La Curva de María offers plenty of natural, historical and cultural activities for all types of travellers. Originally the bread making area of the main house, the Cottage, provides sleeping arrangements for up to 3-4 people, within a beautifully decorated, self-sustained house. 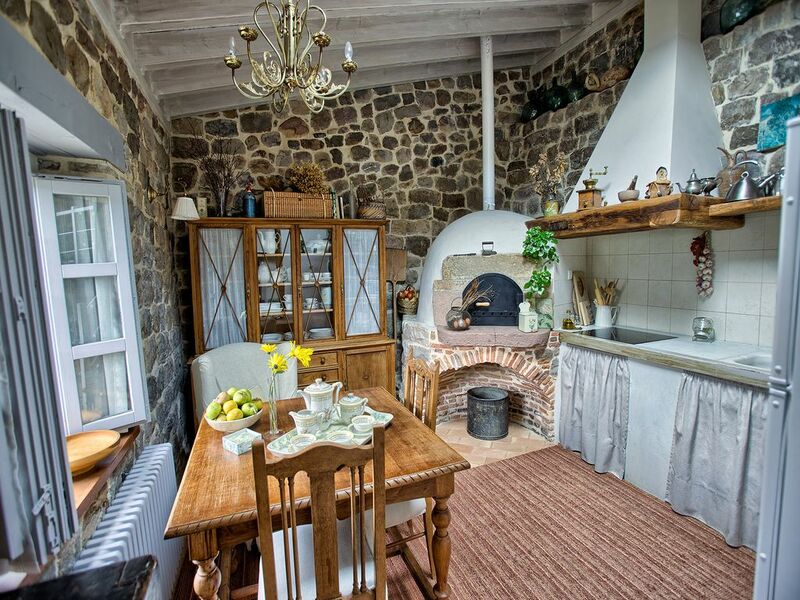 It features one large double bedroom, a smaller double walk-through bedroom, a large living space, a bathroom, and a fully equipped kitchen featuring a traditional bread oven. There is WiFi, heating, a fireplace and a washing machine shared with the rest of the house. Pets are allowed. Maria is a self-started entrepreneur with a passion for art and design. When she was just out of school, she launched herself in the fashion business, opening her first store in the province of Castellón and expanding rapidly across the coast. After 20+ years in the industry, she started feeling she'd enjoy a calmer life away from the big cities and the travelling, and found her dream place in the valley of Cabuérniga. Her and family's lifestyles changed dramatically, from the busy, sunny beaches of the Mediterranean coast to the peaceful, green mountains of Cantabria. Today, Maria runs a successful guesthouse combined with a vintage store and an events hall. Cantabria is full of beautiful sights and things to do: With mountains and sea on the doorstep, you will find yourself inspired more everyday. There are also a bunch of great restaurants, cafes, cultural and historical sights, and outdoor activity providers. Visit our website for more information. Beautifully converted open-plan property, wonderful host! This is a fantastic property, very relaxing with comfy beds. It's been converted recently to a very high standard. Kitchen is fully equipped with everything you need to cook should you wish to. Maria, the host, is lovely and very accommodating and lives close by should you need assistance. The area is beautiful; walks and rivers close by (lovely to swim in!). The roads are great here (no traffic jams) and their quality puts the UK to shame, getting about is easy and there are a multitude of unspoilt beaches, mountains, caves, coastline and countryside to explore. Highly recommended property and region!! La casa muy cómoda y tiene de todo. Maria es estupenda. Simba, la perrita, adorable. Cantabria es una maravilla. Experiencia recomendable. This house is very beautifully decorated and the location in the mountains is wonderful, BUT it was a great disapointment to see how the house and the little yard was placed very close to the road, there was a constant flow of cars and trucks just 1 meter from the table outside even inside the house we could hear the trafic all the time. In the discribtion of the house it was not mentioned likewise you could not see the road in the pictures. We were looking for a quiet and peaceful place to be in our holiday, but that was not here! Maria is a very nice and helpful host but that can not change that we did not find what we were looking for. We are sorry to only give 2 stars. Hola Annette, siento mucho que la casa no haya cumplido todas vuestras expectativas. Posiblemente no hayáis elegido bien el lugar que necesitabais para vuestras vacaciones. Por otro lado considero que mi casa es un lugar muy visitado, bien valorado y muy querido por mis huéspedes. La ubicación es correcta como puedes ver en el mapa dentro de la Reserva Natural Saja Nansa y a pocos minutos de las playas. Un afectuoso saludo desde el Valle de Cabuérniga para toda tu familia. Tolles Ambiente, liebevolle Wirtin. Leider etwas zu dicht an der Strasse und die Hecke ist noch nicht wieder hoch gewachsen. Dadurch kann man nicht so schön draussen sitzen. Antike Möbel und moderne Technik gut vereint. Wie haben uns hier sehr wohl gefühlt. Sehr guter Ausgangspunkt für Ausflüge ans Meer und in die Berge. Der Haushund hat uns auch viel Spass gemacht. Muchas gracias Sibylle, todo un placer teneros aquí. Estoy feliz por vuestro mensaje, eso es que el viaje de vuelta a casa ha ido muy bien. El seto se cortó para pintar la verja pero pronto crecerá.. Saludos de Simba y Bruce. Eine Traumunterkunft in einer Gegend, die vom Massentourismus nicht überlaufen ist! Wir hatten die Unterkunft aufgrund der Lage in Kantabrien und den ansprechenden Bildern gebucht. Die Bilder untertreiben! Es ist eine wunderbare Ferienwohnung, die mit hochwertigen Möbeln eingerichtet ist, teilweise mit Antiquitäten. Die Kombination aus uraltem Gemäuer und aktuellem technischen Stand, hat einen großen Charme. Die Küche ist sehr sauber, alles ist vorhanden, was zum Kochen gebraucht wird. Das Schlafzimmer hat einen tollen Blick auf die Berge. Das Wohnzimmer ist gemütlich. Für die Online-Junkies: Die Internet-Anbindung ist ebenfalls gut. Maria hat uns viele hilfreiche Tipps für Ausflüge in die Umgebung gegeben, die einen Besuch wert sind und die in keinem Reiseführer stehen. Zum Strand ist es eine halbe Stunde mit dem Auto, die Berge beginnen quasi vor der Haustür. Allerdings sollte man sehr vorausschauend fahren, obwohl die Pferde und Kühe auf der Straße Autos gewohnt zu sein scheinen. Ausreichende Einkaufsmöglichkeiten sind im Nachbardorf vorhanden. Wer größere Einkäufe machen möchte oder bummeln will, fährt nach Cabezon de la Sal - was in ca. 15 min mit dem Wagen erreicht werden kann. Fazit: Wir haben wunderbare zwei Wochen dort verleben dürfen und können diese FeWo uneingeschränkt empfehlen. Cantabria is full of beautiful sights and things to do: With mountains and sea on the doorstep, you will find yourself inspired more everyday. There are also a bunch of great restaurants, cafes, cultural and historical sights, and outdoor activity providers. Check our website for more information.